My twenty-fifth ground of 2016 was on Saturday 17th December at Recreation Way in Mildenhall, Suffolk. 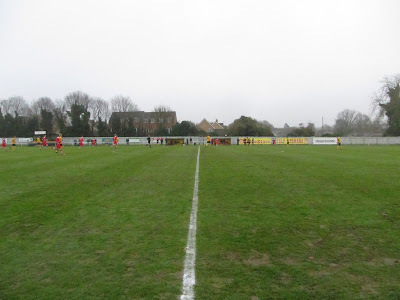 The match was Mildenhall Town vs. Haverhill Rovers in the Eastern Counties League Premier Division. Recreation Way is on the southern outskirts of the town with fields directly to the south of the ground itself. It is bordered by housing to the west, a social club to the north and to the west there is a retail park with Mildenhall Swimming Pool directly behind this side of the ground. The nearest railway stations are Shippea Hill and Lakenheath which are 8 miles north. However with these being two of the least used stations in the country the more convenient locations include Ely, Stowmarket or Bury St Edmunds stations which are all over 10 miles away. Recreation Way has been the home of Mildenhall Town since 1945. The entrance to the ground is in the north-west corner and leads into a covered standing area. Next to this is a nice clubhouse which includes a snack outlet in its exterior. Continuing to work along the pitch there is then a covered seating area which contains 3 rows of benches. At the back of this area are the dressing rooms. The remaining run down to the southern end of the ground is uncovered standing. The eastern side of the venue is uncovered except for a small 50 seater stand near to the north-east corner. The only other item of note on this side are the two dugouts by the half-way line. The areas behind both goals are pretty limited for space so just have a thin area of uncovered standing. With the club aiming for promotion they are planning to build an additional 50 seater stand to meet Step Four ground grading requirements. 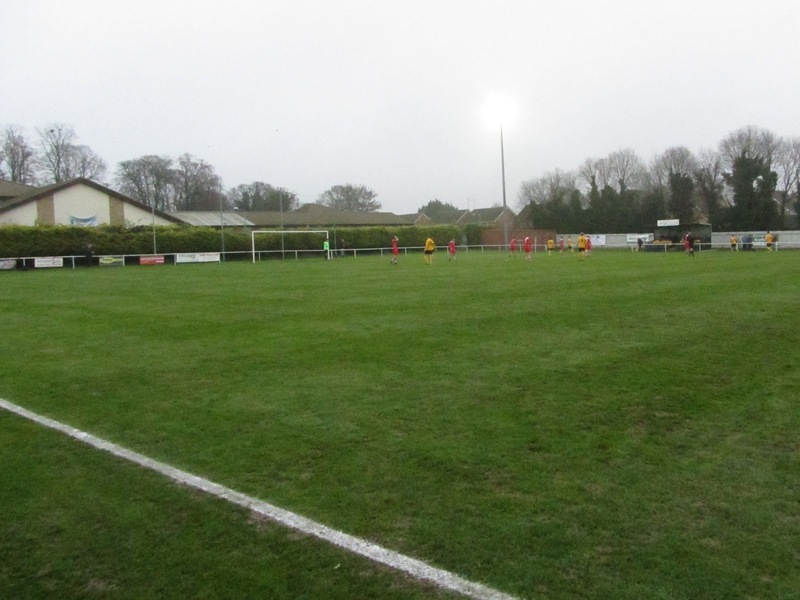 Mildenhall went into the game on a fantastic run having won 19 of their 20 league games so far. As if things weren't going to be difficult enough for Haverhill they were reduced to ten men after just 11 minutes. It came about when the visiting goalkeeper Charlie Turner dropped a cross at the feet of Mildenhall's Chris Bacon. Turner reacted by rugby tackling Bacon to the ground to stop him scoring and was duly dismissed. Without a substitute keeper it was left to defender Sam Holmes to take over and his first act was to save David Cooper's penalty. For the remainder of the half Holmes was not often tested as despite Mildenhall having the lions share of play they did not have their shooting boots on so lots of efforts went high and wide. The 2nd half was completed one sided as the hosts peppered Haverhill's goal with shots but Holmes was putting in an excellent performance to frustrate Mildenhall. The ball barely got out of Haverhill's half for the whole of the second period and finally the defence was breached in the 82nd minute when a cross from Lee Clift to back post found Stephen Spriggs who headed in on the line. The visitors then ventured into opposition territory and looked dangerous as they sought an equaliser. However as they pushed forward the one man disadvantage came back to bite them as in the 89th minute Mildenhall killed off the encounter with a second goal. Dan Brown drove an effort off the bar and when the ball rebounded it was Spriggs who reacted quickest to slot the ball home and grab his second of the match.